The foot of the Western Hills in the southwestern outskirts of Beijing is streaked with sparkling streams and studded with glistening springs. Set against the backdrop of a jumble of mountains, the place is known for its picture-perfect landscape. Imperial gardens began to appear in this part of the world in the 11th century. Towards the end of the Qing Dynasty some 800 years later, these gardens had covered a total of more than 1,000 hectares. 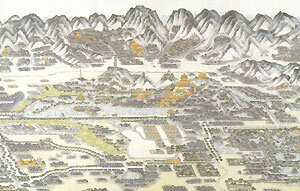 None of the Western Hill imperial gardens, however, are better known than the "Three Hills and Five Gardens", which refer to the Xiangshan (Fragrant Hill), Yuquan (Jade Spring) and Wanshou (Longevity) hills, and the Jingyi, Jingming, Changchun and Yuanmingyuan gardens and the Summer Palace. In the early days these hills and gardens stood independent of one another yet were linked to form an integral whole. Nowhere in this world can one see such a huge cluster of imperial gardens. 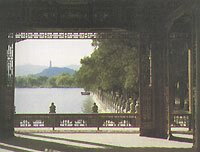 During the Jin, Yuan and Ming dynasties, the major efforts of the emperors were concentrated on the construction of the city of Beijing and imperial palaces in the city, and most of the gardens in the Western Hills were private ones. Beginning from the reign of Emperor Kangxi of the Qing Dynasty, the city ran short of space for further development. During the Kangxi and Qianlong reigns, however, the economy was so developed and the state treasury was so full of money, that the Qing emperors began to seek gratification from a tranquil environment. That was when imperial gardens began to make its way to the foot of the Western Hills, where most of the existing imperial gardens were built during the mid-Qing Dynasty. In the beginning the emperors and their harems went to these gardens for leisure while handling political and sacrificial affairs and spending daily life in the city. It was only after the ascension of Emperor Yongzheng of the Qing Dynasty to the throne that these imperial gardens began to perform a newly acquired function: the monarch's temporary palace. Life was so comfortable there that the emperor eventually decided to stay permanently in western gardens, where they handled state affairs and read books while enjoying themselves. Thus the imperial gardens became the hub of Chinese politics.